Poll – which Tank would you like to see on the new 2016 coin? On September 15th 1916, during the Battle of the Somme, the British used tanks for the very first time in the history of warfare. Now, on the 100th anniversary, a brand new coin is to be issued to mark the occasion. After special permission from the minting authorities, we’re giving YOU the opportunity to choose which tank will be the subject of this historic new coin. Tank experts and enthusiasts often differ in their opinion of what best represents this most iconic of fighting vehicles. Is it the fearsome Tiger from WWII? 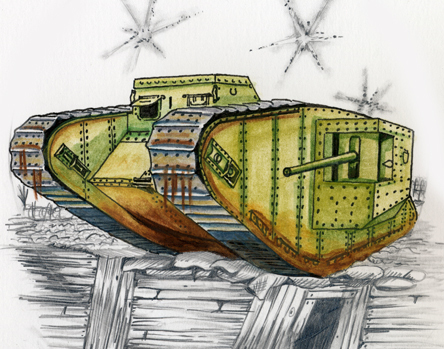 Or the very first tank used in battle 100 years ago – the British Mark I? Or the mainstay of our current armoured divisions, the Challenger 2? Vote now on the poll below. The winning tank will be announced on these pages shortly where you’ll also have the chance to see the new coin unveiled for the first time and the opportunity to become one of the first collectors in the world to own one. Thanks for voting! The winner of the poll was the Mark I WWI tank. You can now own this impressive new coin featuring this iconic tank which has been issued to mark the 100th anniversary. Hint: please make plans for celebrating 100 years of the Battle of Cambrai. The first successful mass tank attack in history. I’m confused now. What I see on this page above is (a) The Tiger (with a long “snout”). Is this tank correctly titled Tiger Tank? I voted (c) – whichever tank it is because it is the latest and should appear in the latest coin. Hi Delysia, really sorry I had the captions on the pictures the wrong way round at the very beginning. Don’t worry I’ve got your vote though. Thanks! Robin. The British Mk 1 is what its all about. Why would you put a tiger ( GERMAN ) TANK ON a coin commemorating the British use of tanks inthe first world war.